Why would anyone want to settle for being average? If you’re average, you’re doomed to being nothing more than any other person on the bus. Salespeople who are average are sucking the oxygen out of the room. Why am I so harsh? It’s simple – Being average is no way to sell, because what it means is helping the customer achieve their fullest potential. There is a reason why top performing salespeople are top performers. They simply don’t allow average to enter into their thinking. My new eBook 14 Things GREAT Salespeople Do breaks down the qualities that set great salespeople apart from average salespeople. Ask yourself this question: If you were a customer and had a choice between working with an average salesperson and a great salesperson, whom would you pick? It’s a no-brainer, right? You would pick the great salesperson. Sure, you don’t always know if a salesperson is great when you first start working with them, but often we do business with someone who has come on the recommendation of someone else? Great salespeople are known by customers and non-customers alike. Why? Because people will send referrals to salespeople who have offered a great experience. The great salesperson not only has repeat sales from their customers, they also create an influx of new business from referrals. If you are buying from a great salesperson, chances are you’re going to buy more and keep the relationship with them for a longer period of time. Plus, you’ll be more likely to refer people to that salesperson. If you were merely buying from an average salesperson, you would buy what you need and probably not be too compelled to carry the relationship forward. And you wouldn’t be too quick to refer others to that salesperson. Being average kills! I can’t say it any more blunt and that’s why the 14 Things Great Salespeople Do eBook will help you move from being average to being something extraordinary. Salespeople fail not because of the lack of customers or their price being too high or any other excuse. They fail because they believe being average is good enough. Does not being average require super-human skills? No! It doesn’t require anything that we all don’t already have. What it starts with is a mindset that draws a line in the sand and refuses to settle for mediocrity. You see, the start of success is not due to what you sell, but rather to how you sell. Great salespeople are not great for only a month, quarter or year. They’re great year after year after year. They do this all based on their ability to understand their customers and be responsible for their own success. If you’re still not sold on the value of being a great salesperson, let me end by asking you this question. If you were about to have major surgery performed on you, would you prefer an average surgeon or a great surgeon? 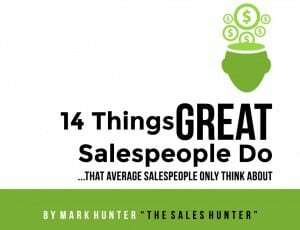 If so, then you’ll want to look at all 14 points in the eBook 14 Things GREAT Salespeople Do. PrevPreviousDo You Know if You Are a Sales Leader?